Ever since Amazon CEO Jeff Bezos suggested using drones to deliver packages to customers, discussions about the possible uses of unmanned aircraft have taken a new flight path. He might have easily been dismissed as a dreamer or an opportunist. But Bezos’ announcement prompted a shift in thinking about unmanned aircraft systems from flights-of-fancy to real possibilities such as crop surveying, fighting forest fires, pipeline inspections, rescue operations, wildlife monitoring and disaster response. As the ideas mature and unmanned aircraft systems become more sophisticated, standard processes to assess usage, safety and technology are necessary. some of which may be developed at RIT. 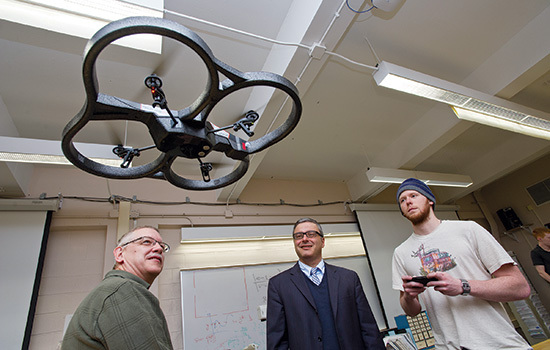 The university is part of NUAIR, the Northeast Unmanned Aircraft System Airspace Integration Research Alliance, a group of more than 40 companies and universities in New York and Massachusetts selected in December 2013 as one of six Federal Aviation Administration test sites in the U.S. The alliance will conduct research and testing of safe integration of unmanned aircraft systems in the national airspace system. Nineteen universities are involved with RIT and Massachusetts Institute of Technology as regional academic leaders, said Agamemnon Crassidis, associate professor of mechanical engineering in RIT’s Kate Gleason College of Engineering. “One of my key roles is to bring the universities together to see what kinds of research they are doing and how we can use that research,” said Crassidis, who will also serve on NUAIR’s board of directors. RIT is well positioned for this work with expertise in sensor and aeronautic system development from the engineering college, and in remote sensing and imaging from the Chester F. Carlson Center for Imaging Science. “This is a significant opportunity to expand use of remote sensing and imaging and make that imaging accessible to a broader constituency. In some disaster situations, especially with state or counties with tight budgets, access to low-cost imaging is big for them,” said Donald McKeown, distinguished researcher in the Carlson Center. controlled model planes. Today, they consist of complex systems for collision avoidance, automated controls and navigation; they also integrate imaging systems to gather and process data. RIT researchers have already been developing aspects of these technologies and can contribute to improving unmanned aircraft systems. Regulations currently do not permit UAS operations above 400 feet without certification, and these allowances are given primarily to law enforcement or the military. The FAA has directed new test site teams like NUAIR to contribute recommendations about how corporate and commercial unmanned aircraft can be part of already crowded skies. The Northeast corridor where NUAIR will operate has some of the highest volumes of air traffic to control. Tim Southerton and Robert Jones, both fifth-year mechanical engineering students, are working on control systems for a Parrot AR Drone 2.0, a quadro-copter. They are upgrading the unmanned aircraft as part of a senior design project, integrating remote sensing equipment onto the frame and adding GPS navigation capabilities. These capabilities and others being developed make Bezos’ idea of delivering packages seem not so far-fetched. According to the Association for Unmanned Vehicle Systems International, UAS may provide 100,000 new jobs in the U.S. and more than $82 billion in economic outcomes by 2025. Talk about soaring to new heights.